Gurgaon has a burgeoning set of Japanese restaurants. The newest one to join the pack is Nagai. 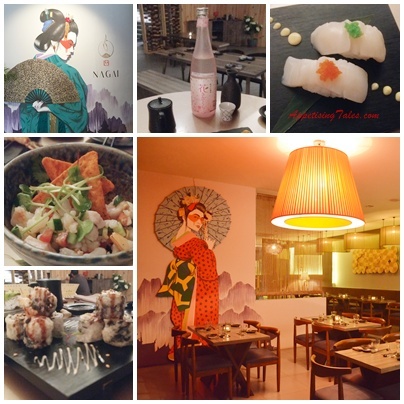 Named after Chef Reina Nagai, this is the second outpost; the first one is in Ibiza. Located in sector 29, Gurgaon, and open only for dinner, Nagai is in a standalone building, away from the bustling market. Split over two spacious floors, the ground floor features a large dining space done in Japanese minimalistic style and large contemporary art adorning the walls. The basement has a well stocked bar, and a performance area which is put to good use on Friday evenings with an assortment of live music performances. The seating arrangement here is more casual with plenty of high tables and comfy bar stools, as well as lower chairs and tables. The crowd is eclectic on the Friday that we visit, with a few couples enjoying their date night, a bunch of girlfriends, some Jap suits as well as a large family group. Nagai: Food, Sake and Decor. The food has plenty of choice for non-vegetarians as well as vegetarians. Although the fare is primarily Japanese, there are influences from Thailand, Spain, Mexico and Italy, where Chef Reina and her partner Eleonora have spent a lot of time pursuing adventure sports ranging from snow-boarding and sky-diving to surfing and deep-sea diving. Prior to Ibiza, the duo had restaurants in Thailand and two in Rome as well. Hence the menu includes Japanese inspired tapas from classic steamed edamame to crispy pork and aubergine skewers. Starters feature salmon and tuna tartar and vegan choices such as caramelized lotus root with soya and sesame. The highlight of our meal includes ceviche with prawns and seabass zinged up with lemongrass and ginger. The scallop nigiri is another fabulous offering on the menu. The bar is rather impressive with some seasonal and Japanese inspired cocktails, using fresh fruits and sake respectively. The choice of Sake is good and the waitstaff is well trained in helping guests pick the right tipple too from a junmai to shenjyu. We’re asked about our preference for dry or sweet sake and suggested accordingly. Both, the Hana Kizakura Junmai and Kubota Senjyu that we try are premium quality. Maybe we chose a wrong day, but refrigeration seems to be a problem. We’re sure that this technical glitch can easily be handled, because maintaining the right cooling temperature is critical for Japanese cuisine due to the abundant use of raw seafood. While the Nagai black cod turns out to be a waste of the Alaskan fish due to its excessive saltiness, we also think that the sushi can be rolled better considering the prices that one is paying for this meal. Teething troubles, maybe, but once sorted, Nagai definitely has the potential to be a great restaurant. It will be worth going back for a hearty bowl of Japanese curry chicken as well as their selection of house made gelatos and semifreddos. Nagai, SCO #305, HUDA Gymkhana Road, Sector 29, Gurgaon. This article first appeared on travelandleisureindia.in on May 5, 2017. It has been modified by the author to fit the requirements of AppetisingTales.com.